I am based near Leighton Buzzard in Buckinghamshire, England, and can travel to West Herts, Beds and Bucks (or further afield for whole day projects). I teach djembe+dundun classes for adults and children as well as workshops for business and education, also private tuition. And percussion is not just all about drumming - check out our unique new Cosmic Percussion sessions. 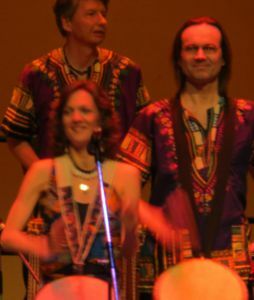 I have been studying percussion since my college days, and specifically djembe since 1992. 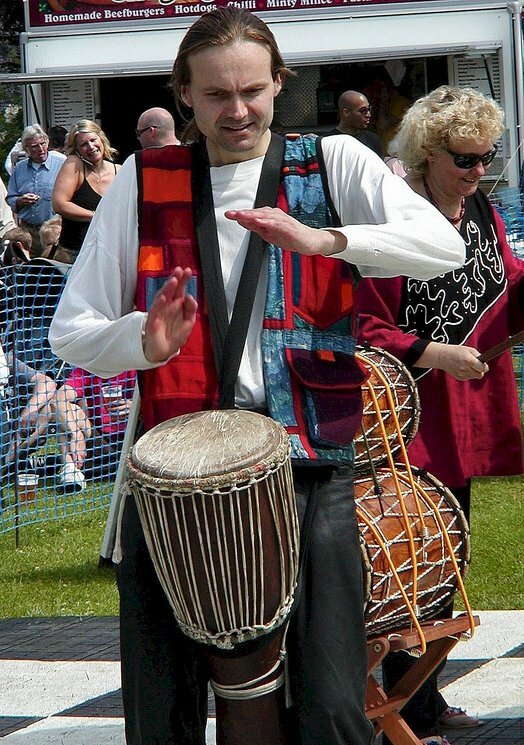 After forming the Canopus Percussion Ensemble in 1995 following intensive studies with master drummers in London, I began teaching African drumming in 1999. In 2005 I extended my learning to embrace dun duns, the bass drum heartbeat of African rhythms. I've since embarked on field trips to Africa to study with master musicians in their native villages, to experience directly the vibrant culture of West Africa, which I am committed to bringing to a wider audience, sharing the joy and unity it creates. It is to this aim that I set up Drumming Is Fun back in 2008. To broaden my skills, I attend (and deliver) various CPD training courses including extra-musical skills such as working with people with Autism and Chellenging Behaviour. I currently perform with my Bedford Djembe Group, as well as Vitae Drummers and other groups in Milton Keynes and St. Albans. In the past I led Secret Bass, and was formerly a founder member of Africa Junction and The Naked Truth. I also ran Beat Camp, a friendly drumming event near Bedford, and was Music Director of the Indian Summer Festival held at Walkern Hall near Stevenage. I love polyrhythms and thrive on syncopation. As well as drumming, singing is an increasing passion. I now teach songs from Africa and around the world, perform as bass soloist with Raise The Rafters choir in Aylesbury and sing and play percussion with African master harpist Sidiki Dembele. When not out working with other people, I'm busy in my studio completing my first album ready for a 2015 release, and remastering many older archived recordings. If you can afford the extra cost, having a co-facilitator will greatly enhance your experience and we'll achieve better results more quickly; (s)he can lead one part while I lead other rhythms, as the call-&-response nature of African drumming depends on having many rhythms going on at once. Plus, we can be twice as loud and play more diverse music, not to mention the dynamic interplay between us. Naturally we have all been CRB/DBS-checked (Enhanced Disclosure) for working with children and vulnerable adults, and Chrissie and I are both First Aid Trained. Chrissie is based in Aylesbury and has been drumming avidly for a few years after being wowed by seeing Justine's Vitae Drummers group performing, which she later joined. Following her wise feminine intuition, inspired by a transformational firewalk she did, Chrissie left her day job and started her own company called Wild Peace, offering sound healing, holistic therapies and workshops. She also works as my main co-facilitator with Drumming Is Fun, teaching in schools and community, singing and playing dun duns, djembe and singing bowls and gongs. Justine is based near High Wycombe, and we've been working and performing together for many years since she invited me to attend the brilliant Winterdrum events she organised there. 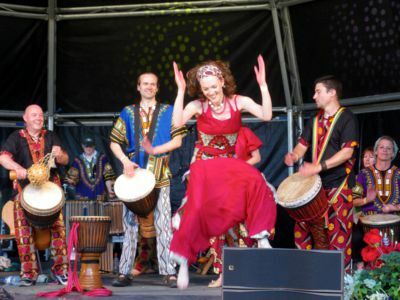 Back in 2006 we went on a drumming trip to West Africa, and she returns each year whenever possible to further her vast repertoire of traditional African drumming and dancing. She also forges links with the many African master drummers residing here in UK and stages exciting events to showcase their talents. She is a veritable authority on all things West African and teaches with pure passion and joy. As a result her drumming and dance teaching is in high demand. She also composes and sings beautiful songs, performing solo and leading Africa Junction, of which I also was a founder member. You can read more about Justine's classes in High Wycombe and Wendover on her website. Barry is based in High Wycombe. We also met in Justine's Vitae classes, and soon found a shared love of music. He attended my Secret Bass group for many years and has developed his techniques and vast repertoire with continuous playing day in day out. After study in Senegal, he now plays dun duns with some of the leading groups in the UK, and as lead bass drummer supporting Justine's classes and workshops. We often work together as a 'Dream Team' trio with Justine teaching dance aided by Barry on drums while I teach drumming and song. 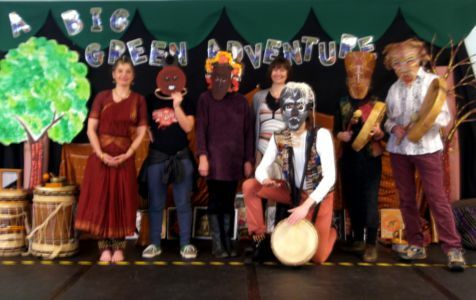 We also love to work with an expanding number of other workshop leaders to offer exciting carousels of rotating activities such as various dance forms and song as part of varied Multicultural Enrichment Days.